I'm back!! We have had way too much illness this past week (as in stomach flu and croup). My small people have been in terrible shape and I have been too spent to post. The general rush of December has also not improved matters and the result has been radio silence. Back to business. 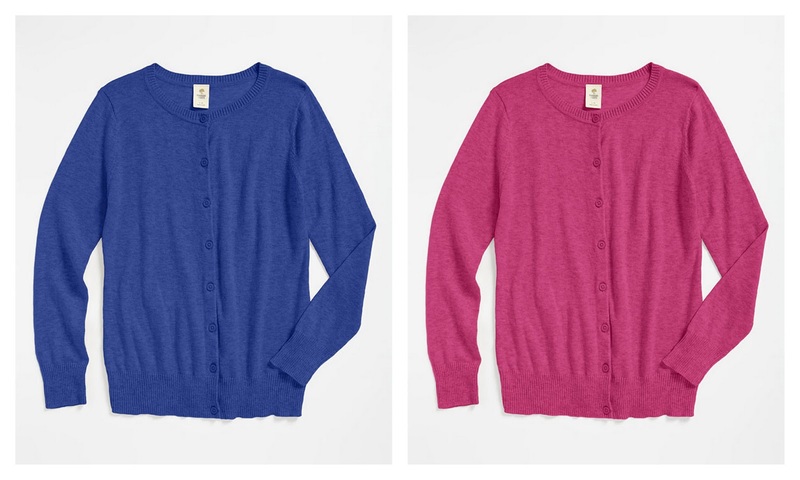 I think that a basic all-year cardigan in a solid color is one item that every little girls' closet should have. The problem is that they are often really expensive and feel more like a splurge than a dependable basic. I saw these Tucker & Tate cardigans at Nordstrom today and think that the current price is exceptional. They are 50% off at $13.98*, and they come in little girl (pink, blue) and big girl (pink, blue) sizes. Though difficult to discern from the images above, the colors are slightly heathered, yet vivid and lovely. And, as always, shipping is free from Nordstrom. Order by December 21st for free Christmas delivery! *Note: The little girl cardigan in blue is $18.76 for some reason. I was at Nordstrom yesterday and am virtually certain that it was $13.98 in the stores. All of the rest are $13.98.